SERVPRO of Brookhaven, McComb & Columbia ensures that your crisis gets seen to, no matter what. We even had our marketing manager out doing dirty work with us today. It takes all hands to make our community a better place, once restoration job at a time. In this photo, you can see he was removing damaged insinuation from underneath a mobile home. We work hard to see to every job that is called in. Trust your dedicated restoration company. Trust SERVPRO. After a fire left a home saturated in thick black soot, our technicians' tedious hands and attention to detail recovered the majority of the content that came out of the fire. SERVPRO of Brookhaven, McComb & Columbia has not only the trained technicians but also the products to restore your damaged belongs. You can always trust the green team to come take care of your business's needs any time of the day. SERVPRO of Brookhaven, McComb & Columbia loves making every customer feel special. Remember we will always work around your schedule/business hours to help minimize interruption to your business. This is a small glimpse at what a tropical storm could do to your home. Water can cause so much damage, and left without tending to can eventually cause mold. Storms can cause unwanted water to enter into your home through something as simple as a roof leak or if winds are strong enough, a tree falling through your home. Whatever storms throw your way, SERVPRO of Brookhaven, McComb & Columbia can extract and dry up all the water to get you on the path to restoring your home back to normal. It is not unusual for SERVPRO to get calls about hot water heaters leaking and causing unwanted water in residential homes/commercial facilities. In this particular case, the hot water heater leaked long enough for the wood floors to absorb the water and seep through the cracks. Everywhere you stepped, you could hear the squishing of water. But that was just another day for our technicians and another job well done when they dried up all the water and was able to restore this homeowner's laundry room back to it's normal condition. Business owners, do not forget about the upkeep of your business! When a customer walks in and the first thing they see is a dirty rug/carpet, that immediately gives them the wrong impression of your business. We understand the hustle and bustle of ever day life and running a business can keep you busy, but it's as simple as giving SERVPRO a call and we will pick up, clean and drop off those rugs for you so your business isn't interrupted. Need your carpet cleaned? We can also arrange ahead of time to come in after hours. SERVPRO of Brookhaven, McComb & Columbia is the disaster recovery team you need to begin the process of restoring normal to your life after a devastating storm hits. Trust the green team. Call the professionals. Here at SERVPRO of Brookhaven, McComb & Columbia, we are always ready to help make our community a better place, one restoration job at a time. This photo is a snapshot of one of our vehicles before dispatching for a job. We are faster to any size disaster, 24/7. Can't handle the disgust of cleaning up mass animal feces? You don't have to! SERVPRO of Brookhaven, McComb & Columbia not only has the stomach for these types of jobs, but we have strong sanitary and odor removal products to give your carpet a true cleaning. Enough is enough. Do not be embarrassed of your home, but be proud of it when guest come to visit. SERVPRO of Brookhaven, McComb & Columbia works with your schedule and gives a courtesy call before we head to your property. If you have any pricing questions, feel free to call us at (601) 823-1100! How Quick Does SERVPRO Respond? Here is an example of how quickly we respond. We received a fire damage claim from McComb this week, and on the same day it was called in, we came out to do a walk through. We captured the cause of loss, as you see in this picture. The next morning, our technicians dispatched to the site and started the restoration process. SERVPRO of Brookhaven, McComb & Columbia aims to respond as soon as possible to your emergency. Our trained technicians know exactly how to handle a storm loss job and be sensitive with the home/business owners. We clean up the major mess so you don't have to. Grease fires happen more often than you think. All fires leave a distinct odor afterwords, but grease fires have a particular foul odor. Our technicians are trained with proper equipment and products to help remove soot & odor. Depending on the extent of the fire, we try to salvage as much as we can. Some cases aren't so fortunate. 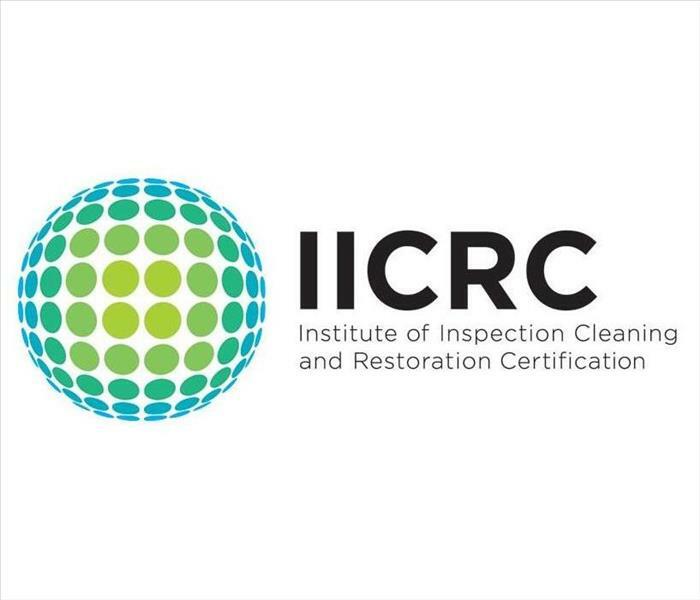 More than just removing excess water, IICRC-certified restorers have the knowledge and equipment to further dry a home or facility (including substructure materials) completely back to preloss conditions. Through timely response and the careful monitoring of water damage, mold and other health issues can be prevented. 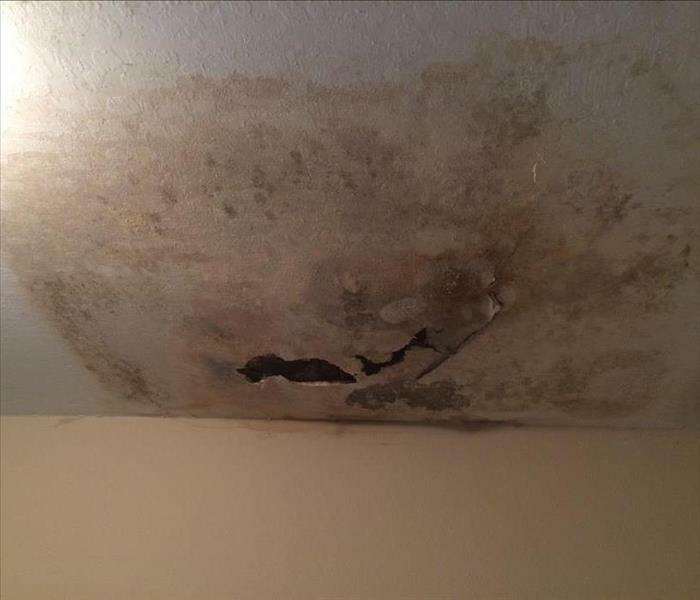 If water damage has been present too long, mold will occur. SERVPRO of Brookhaven, McComb & Columbia has dispatched for Hurricane Harvey, Hurricane Florence and now Hurricane Michael. Our technicians are dedicated to helping those in need. 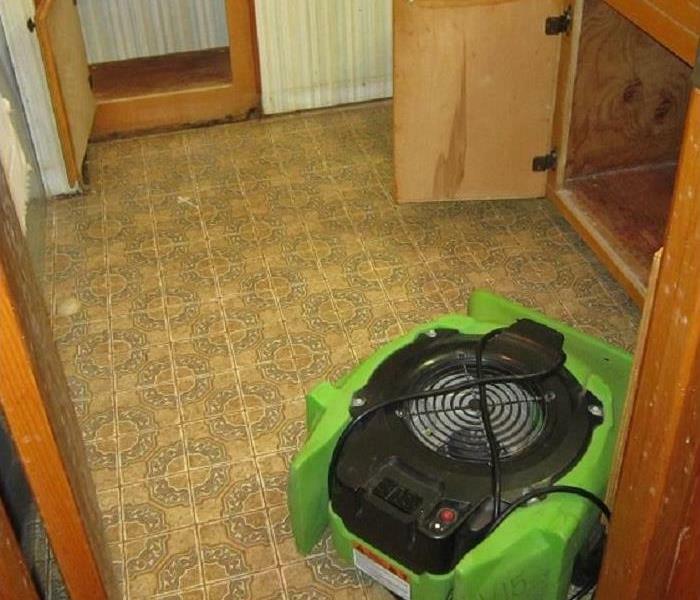 No job is too big for SERVPRO! 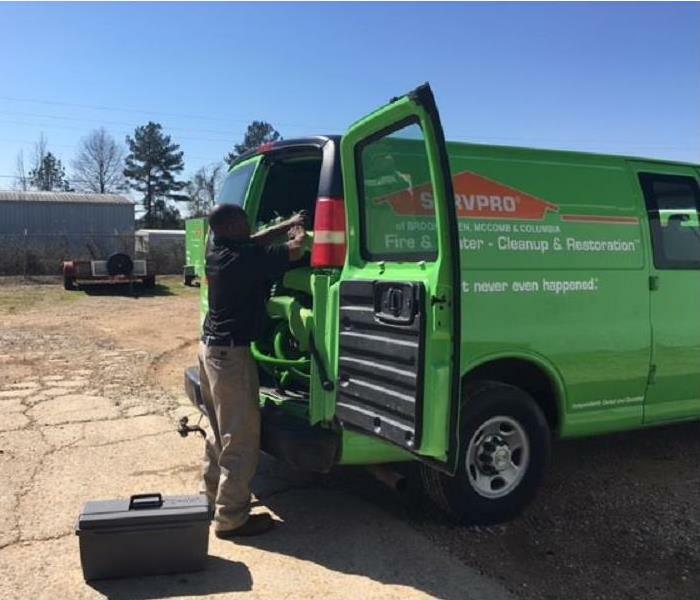 Whether its an apartment, trailer, one story house, or two, SERVPRO of Brookhaven, McComb & Columbia is always ready to help! Our professional technicians have the experience and knowledge on how to approach each job. Each situation is different and it is important to trust the experts that has just about seen it all. 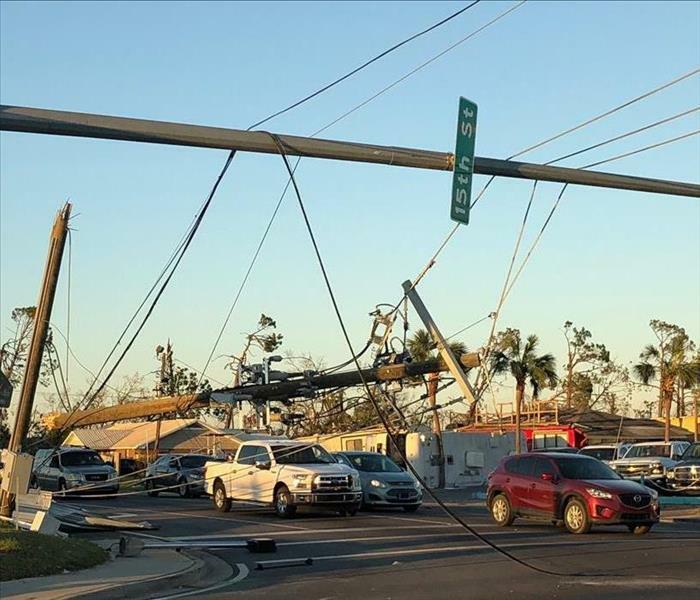 Our technitians have been working hard to help hurricane victims restore their businesses and homes to preloss conditions. SERVPRO is faster to whatever size disaster! You can count on your local restoration company to join in to help. It is not uncommon for homeowners to return from being out of town to a home full of water due to some type of leak or pipe bust. We know that no one plans on this happening but we want to be top of mind if it does. SERVPRO of Brookhaven, McComb & Columbia has trained professionals, who care about your business or home as if it is their own. This can be a tough time for you and your family. Give us a call if you need us, (601) 823-1100. Experts Make Rug Like New! When we received this beautiful antique rug, it was hard to tell how dirty it was. But when our technicians started the cleaning process, you could immediately tell the difference! Don't be blind to how dirty your carpet or rug is. 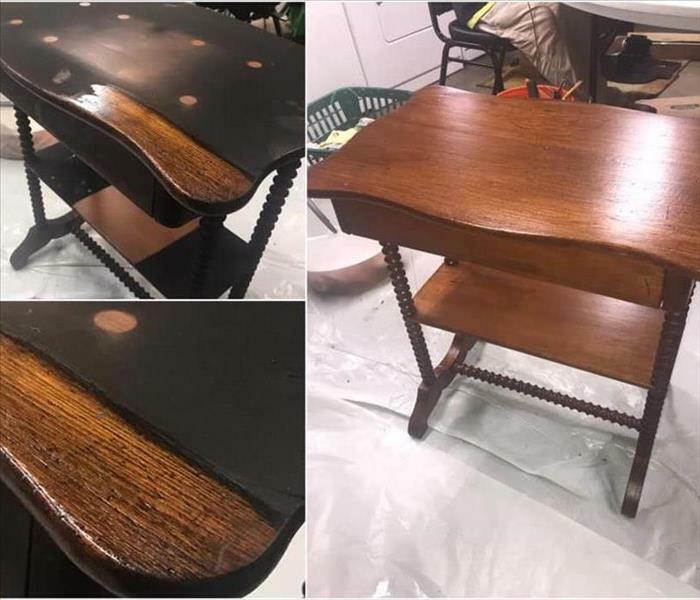 Let us clean it and make it look like it used to! Why SERVPRO? Because we want to save our customers as much as possible, including their time. Our professional technicians are considerate and careful to get the job done right the first time. We try to give you tips on how to prevent so much damage for future references. We also offer a free Emergency Readiness Program (ERP) for our customer's convenience. This especially benefits businesses from major interruption and extreme loss. As many as 50% of businesses may never recover following a disaster, according to the latest industry research. We also come to you and help you set up your ERP free of charge. SERVPRO cares. If you'd like any additional information, please call us at (601) 823-1100. We received a call from an elderly woman that her hot water heater leaked all throughout her laundry room and traveled to the kitchen. Our SERVPRO technicians did not hesitate to respond. They got in there, analyzed the damage and started working immediately. 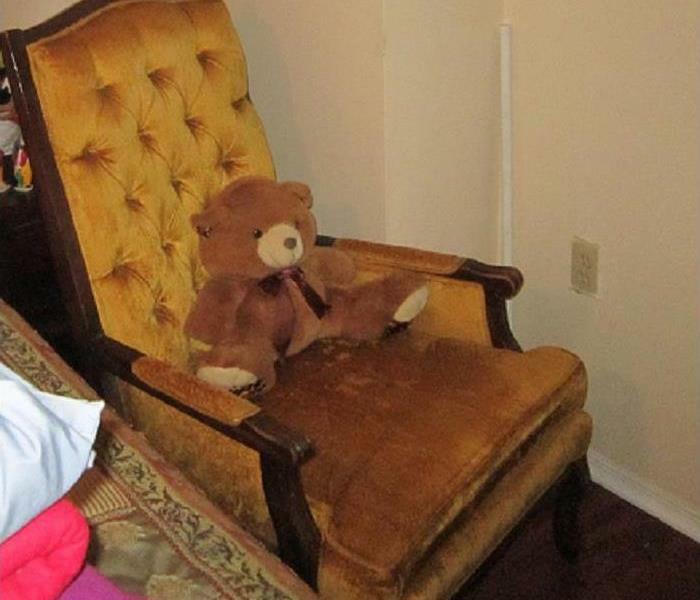 Our crew made sure that our customer was comfortable and not bothered as they began the restoration process. Needless to say, we left this sweet customer with a smile on her face. As you can see in this Lincoln County church photo, they had a pipe bust during one of the hard freezes we've had this year. We acted as fast as we could, regardless of the size of the church. We were able to dry and salvage their carpet. They now can carry on with their normal activities. Mold likes cool damp areas, normally areas that we do not pay much attention to. This homeowner happened to be doing some work on their dishwasher and moved it. When they did, this is what they discovered. SERVPRO of Brookhaven, McComb & Columbia can remove your mold problem "Like it never even happened." Unwanted water can be damaging and put your life on hold until the issue is handled. Thankfully, SERVPRO of Brookhaven, McComb & Columbia has the highly trained professionals to help you resume your every day life. We have proper equipment to remove any unwanted water in your home or business. After a fire attacks your home or business, it not only leaves behind a foul odor but also soot. We received a call to clean up after a fire in this Columbia home. We have certified technicians that are professionally trained to properly clean your home or business "Like it never even happened." Animals will be animals, and sometimes pet owners have to clean up accidents that stain their carpet. Even animal fur can change how clean a carpet can look. SERVPRO of Brookhaven, McComb & Columbia has the expertise to provide a deeper clean than your basic house cleaning service. Our residential cleaning services will ease the burden of the constant maintenance cleaning of your home, but will also create a safe, clean and comfortable living environment for you and your family. We try to save your carpet from having to be replaced due to water damage. But prolonged water damages will ruin your carpet. In that case, in order to dry the floor properly, we have to pull up carpet and set up air movers. This is the aftermath of a water damaged building in Lawrence County. Our professional technicians pulled the baseboards from the walls without damaging the walls or baseboards. Removing the baseboards are necessary in order to start the drying process. Our technicians handle our customers belongings with care and make disasters "Like it never even happened." We know that your house is not just a structure, but it is your home where memories are made and shared. Our SERVPRO crew does everything possible to clean behind these disastrous storms, and salvage as much as possible. Water can make such a big mess. SERVPRO of Brookhaven, McComb & Columbia is ready for anything! We got the call and our crew responded within the hour! We not only cleaned up the mess, we also gave tips on preventing the issue in the future. When a freeze comes through town, it is easy to have a water damage. SERVPRO of Brookhaven, McComb & Columbia's most common calls during the winter is busted pipes from a freeze. We respond immediately every time. If a fire happens in the kitchen, it can effect the whole house. Smoke travels and soot makes it look like everything is ruined. Don't worry - SERVPRO of Brookhaven, McComb & Columbia's goal is to save as much as possible. We will thoroughly clean the entire residence and make it "Like it never happened." 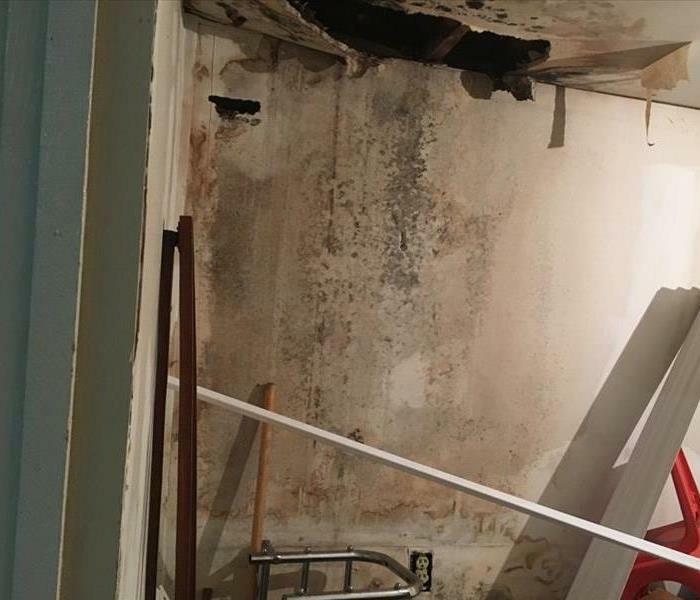 This photo shows the consequences of what unnoticed water leaks can do to your home. This home owner never went in this room and was so shocked to see what happened to her home. We thank her for calling us and letting us fix it for her. Ever experienced a grossed out scene like this?? Not a problem for SERVPRO of Brookhaven, McComb & Columbia! Unwanted visitors can creep in and leave a big mess that you shouldn't have to clean up. We'll take care of it for you! This home owner woke up in the middle of the night to a burning kitchen. Her oven activated its self-cleaning mode and caused the kitchen devastating fire damage. SERVPRO was able to save most of her cabinets and removed all the soot throughout the whole house. Good job guys! SERVPRO of Brookhaven, McComb & Columbia is highly experienced in water restoration, and we send our trained technicians to take care of you. We don't take your business's water damage lightly. 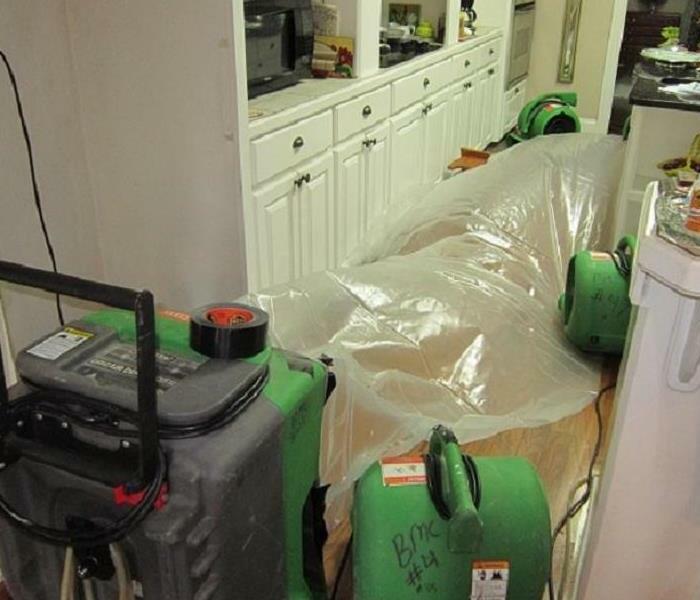 This picture shows us using our air movers to quickly dry the water that has almost taken over this bathroom. Faster to any size disaster! We do not let storms hold us back here at SERVPRO of Brookhaven, McComb & Columbia. If your house or business is flooded, do not fret. Call us day or night, and we will come running. Let us help you. Luckily this homeowner caught it just in time! Our SERVPRO crew dove into it like it was nothing. We were able to kill the mold and clean it up within an hour for this local homeowner. Severe heavy rain caused this residential flooding. Our SERVPRO crew responded to the call as soon as possible. This family could finally relax after we dried up all the water off their concrete floor. Electrical fires are very scary and devastating. One of the worst things to do after a fire is assume everything is ruined. SERVPRO's goal is to save as much as possible. Call us for your fire damage restoration! No mess is too big for SERVPRO of Brookhaven, McComb & Columbia. We came immediately before this homeowner's floor was ruined. Using air movers and dehumidifiers, we managed to save their kitchen floor! "There is Water Everywhere, HELP!" Water damage can be costly and cause a major disruption in your business. Do not pull your hair out yet! Call SERVPRO so we can help you resume your business as soon as possible. This home owner experienced some major mold issues as you can tell in the picture! It is best to call the professions like SERVPRO to come clean the mold off your surfaces. We are here to help! No job is too big for SERVPRO of Brookhaven, McComb & Columbia. This picture is a company that experienced major water damage. The owner said he was very pleased with the our work and was glad that Google pulled up SERVPRO to do the job! We love to make our customers happy! Nothing is more inconvenient than having to put your business on pause because water found its way to you. Business owners can't control the weather, and accidents do happen. This building was effected by all the heavy rain this month. SERVPRO set up a few air movers to get this show back on the road! We can't control the weather, but we can control the cleanup afterwards! Storms can cause major damage to your home and business. SERVPRO of Brookhaven, McComb & Columbia can help with any of your storm restoration needs. It does not matter if it's your home, school, library, store or any other kind of business, SERVPRO is always here for your fire or water damage restoration. Our team tackled the water in this library and had all the books and floors dry. Water damages can be just as devastating as fire damages. Do not jump to conclusions when your personal items have been water damaged. Act Fast! Call SERVPRO of Brookhaven, McComb & Columbia at (601) 823-1100. Mold Mold Go Away! Due to heavy rain storms, our local church experienced some major flooding. By the time the weather cleared, mold set in. This did not only affect a family, but many families that is apart of this church. SERVPRO of Brookhaven, McComb & Columbia came to save the day! This is the results of a customer that walked away from her stove and forget to check on it. We thank her for calling SERVPRO of Brookhaven, McComb & Columbia to come restore her kitchen back to normal. Accidents happen every day. We understand! Don't sweat it! It does not matter if you are in Lincoln, Pike or Marion county. SERVPRO is faster to any size disaster! Call us day or night and we will come ASAP! Local home owner called upset about her ceiling. Our highly trained professionals at SERVPRO of Brookhaven, McComb and Columbia quickly responded and discovered that the water was caused by a leaky pipe. We removed all wet insulation and had it dry within two days! The ceiling was then ready for sealing and repainting, as if it never happened! You will see our green vehicles all over Lincoln, Pike, and Marion counties! We are quick to jump to your restoration emergency. We respond 24/7 to your fire, water, and mold damage cleanup needs. This is the results of what water and mold can do to a building. This horrific scene was completely cleaned in the matter of hours. SERVPRO of Brookhaven, McComb and Columbia showed up within the hour called and jumped in the job like it was nothing. When a call comes in about a local business flooded due to a faulty valve. Our team was able to respond to standing water and help the customer continue business as usual by responding faster to any size disaster. When you come home to water where it shouldn't be call the local team. SERVPRO of Brookhaven, McComb & Columbia was able to help this customer still keep their vacation plans after cleaning up their home from a broken supply line. SERVPRO of Brookhaven, McComb & Columbia responded to a call to help clean a house that was purchased from auction. What could be classified as a hoarder house, was able to be transformed into a future home. A Customer recently sent us a picture of her kitchen after and unfortunate kitchen fire. SERVPRO of Brookhaven, McComb & Columbia was able to go in and remove the unsalvageable materials and clean the rest of the home so that the home owner could enjoy her home. Recently our team was called in to asses the damage caused by a break in that occurred while the family was away on vacation. We were able to help advise the family to their options and get back to Normal as soon as possible. Recently members of SERVPRO of Brookhaven, McComb & Columbia attended a IICRC approved course to learn ways to better identify and remidiate homes after they have experienced a potential mold loss. Our team is constantly learning new skills to better serve and assist our customers. Fire damage can often compromise windows, walls, and roofs. To maintain security and to protect against further damage, SERVPRO of Brookhaven, McComb & Columbia was called to board up missing windows and wall.